You have heard that it was said to those of old, “You shall not commit adultery.” 28 But I say to you that whoever looks at a woman to lust for her has already committed adultery with her in his heart. 29 If your right eye causes you to sin, pluck it out and cast it from you; for it is more profitable for you that one of your members perish, than for your whole body to be cast into hell. 30 And if your right hand causes you to sin, cut it off and cast it from you; for it is more profitable for you that one of your members perish, than for your whole body to be cast into hell. As Jesus taught the people seated with him upon the grassy slope the sea of Galilee was well within view. Upon these water pleasure boat full of Roman soldiers often plied. These pleasure boats would be scenes of drunken debauchery with any numerous practices of a sensual nature would often take place. 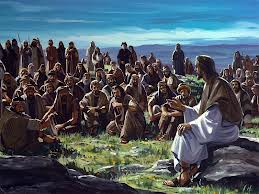 The people expected to hear from Jesus a stern denunciation of this class of people with their evil practices and customs, but to their astonishment they listened as Jesus lay bare the evil of their own hearts. Although the people would not have publically participated in such a horrible thing, Jesus showed them that when thoughts of evil are loved and cherished however secretly they may be kept, that sin reigns within the heart. Christ was saying that what is often hidden within the heart of mankind will manifest itself into actual practices that are out of step with God’s moral law. Solomon in Proverbs 32:7 and 4:23 says, As a man thinks in his heart, so is he; for out of the heart are the issues of life. From time to time in the medical community it becomes necessary to remove a limb to save the rest of the body. Here Christ is saying “If your hand causes you to stumble, cut it off.” Would he really want us to be walking around without our hands or missing an eye? If we are willing to have a leg or an arm removed to preserve the rest of the body, should we also not be willing to give up or surrender that which causes our spiritual life to suffer. Does a recovering Alcoholic willing go to the bar. Usually no because the temptation would be to strong. You resist the temptation by removing yourself from where the temptation is. The term to pluck out your eye or cut off your right hand is referring to cutting out from your sight that which causes you to sin and removing from your reach that which would also cause you to sin. It is through the gospel, that souls which are degraded and enslaved by Satan are to be redeemed to share the glorious liberty of the sons of God. God’s purpose is not merely to deliver from the suffering that is the inevitable result of sin, but to save from sin itself. In order for us to reach this high ideal God wants for us; that which causes the soul to stumble must be sacrificed. It is through the will that sin retains its hold upon us. The surrender of the will is represented as plucking out the eye or cutting off the hand. Oh, how often it seems to you and me that to surrender the will to God is to consent to go through life maimed or crippled. But it is better, says Christ, for self to be maimed, wounded, and crippled, if it ensures you may enter into eternal life. That which we look upon as a disaster in the giving up of our will is the door to highest benefit which is eternal life with Christ. As Adam and Eve were subject to life while they remained connected to God, they forfeited life when they sinned and became subject to death. Christ showed us how to live our life when we sacrifice our will to God. Because Christ paid the price for our separation, we are again joined to God through Christ and again subject to life. Not until Jacob fell crippled and helpless upon the pre-incarnate Christ did Jacob he know the victory of conquering faith and receive the title of a prince with God. He had surrendered self and it was when he “halted upon his thigh” (Genesis 32:31) that the armed bands of Esau were stilled before him. Then later Pharaoh, proud heir of a kingly line, stooped low in reverence to crave Jacob’s blessing. So in this way was Jacob made the captain of our salvation, made “perfect through sufferings” (Hebrews 2:10), and the children of faith “out of weakness were made strong,” and “turned to flight the armies of the aliens” (Hebrews 11:34). So do “the lame take the prey” (Isaiah 33:23), and the weak become “as David,” and “the house of David . . . as the angel of the Lord” (Zechariah 12:8).